Pictured here are my great grandmother, Virta Knutz, with her boys, Willie, 7, and Howard, 5, about 1918. They lived on this place, east of Virgil, South Dakota, until sometime in the 1930s, when they lost it in the Great Depression. My great grandfather, Will Knutz, with the boys, on the front “deck”. I love the old lace curtains in the window, and wonder what the room looked like on the inside. Looking at the photos makes me wish I could step back in time, and experience what it was like to live on the old farm, and how day-to-day life felt for them. On a trip back to South Dakota, I wanted to find the old farm. I drove past it several times, before realizing the old house was probably behind a thick patch of overgrown trees set far back from the road. The driveway, mostly filled in with weeds, was gated off, but I parked my car and climbed over the fence, and began the walk through the hip-high grasses. Little by little, the tangible reminders of our memories grow old and fall apart, and eventually cease to exist. Such was the fate of the old farmhouse. Broken windows, doors torn off, and graffiti sprayed across the walls were stark reminders that nothing lasts. I wondered if the kids with the spray paint had any idea that my great-grandmother had lovingly made that room into a warm place for her family, with beautiful old lace curtains where there now was broken glass. Or, where they stood destroying things, that a young family had once started building a legacy. Heading back to my car, I stopped at the edge of the grove and took one last look back, and for just a moment I could see Virta peeking through the lace curtains, smiling, waving goodbye. Holding onto the tangibles forever isn’t always possible, but thank goodness what exists in our hearts is safe. The old farmer, my great-grandfather, Will Knutz, surveys the landscape after a hard days’ work on his farm in Clyde township, Beadle County, South Dakota. I’m going a barn dance! And in the 1930s and 1940s, with dust in the fields, worries galore, rebuilding what was lost, and war, It was a time to put your worries aside. It was a time to socialize with your neighbors, tip a few, kick up your heels. There was no shortage of these dances on the prairie, and on any given weekend one could have their pick of where to go and what band to enjoy. Ladies often were admitted free, while the gentlemen might have to pay 25 to 30 cents to get in. Among the popular local bands in and around Huron, South Dakota were such groups as the Golden Pheasants; White’s Red Jackets; the Rhythm Ramblers; Doyle and His Old-Timers; the Sod Busters, and the Bill Knutz Orchestra, in whom I have a vested interest. While these bands did sometimes play in larger venues, such as the Band Box east of Huron, they frequently booked their jobs in the barns of their neighbors. Henry Meyer, who lived north of Wessington, Ed Langbehn, near Wolsey, Bill Schwartz, west of Huron, and Albert Baum, southeast of Huron, were frequent hosts of these weekend escapes. I’m not sure when my grandfather, Bill Knutz, first became interested in being a band leader. As a young man, he farmed himself out (pun intended) as a hired man, and did some traveling around the midwest during harvest time. He lived frugally, and when the season was over, treated himself to a saxophone he’d found in a pawn shop in Nebraska, as well as a ring for his favorite girl. Both ended up being “keepers.” He taught himself how to play, and eventually formed his first band, “Bill Knutz and His Harmonians”, including his future brothers-in-law, Ray Christensen playing the fiddle and trumpet; Clarence Christensen playing the clarinet; and Bill’s brothers Howard playing the bass fiddle, and Richard on the drums. Bill’s mother, Virta, kept track of their bookings. The Harmonians were rearranged to form the Bill Knutz Orchestra, when the band leader discovered his girl was also a mean piano player, and a good-looking girl in the band never hurt business… Unfortunately, it was not so easy where the drummer was concerned, and he had to settle for a fellow without much rhythm, who liked to keep a bottle by his drums for an occasional “swig”. When the drummer would speed up or lag behind with the tempo, fortunately all it took was Bill to wander back to the drum set and blow the sax into the poor man’s ear until he was back on pace. Realistically, none of these people were professional musicians, just working folks with a day job, most of them dirt-poor farmers looking to make a few extra bucks for groceries and have a little fun in the process. Both my mother and my mother-in-law grew up on South Dakota barn dances, and described similar situations throughout the 1930s and 1940s. Large crowds, comprised of whole families, would attend these outings, and often it was here that youngsters learned to dance. Sonny Baum taught both his daughter and my mother a three-person dance called the Butterfly Dance; similarly, my mother-in-law, a lifelong fanatic, would dance with her father, Casper Kluthe, when he wasn’t busy on stage with his accordion. The smell of hay, the noise, the applause, the rowdy activity, with the younger children curled up and sleeping blissfully in any available corner, all while the band rocked out “Swingtime In The Rockies” and oldies like “Little Brown Jug.” “I’ll never forget those dances in our barn,” said my mother-in-law, and she never did. Alzheimer's robbed her of many of her treasured memories, but not these. The Bill Knutz Orchestra eventually dwindled to just the two main members, Bill and his favorite pianist, and an occasional granddaughter (moi) warming the piano bench next to her grandmother, learning the chords to such favorites as “Hang Down Your Head, Tom Dooley,” while the the more talented of the duo played the melody. The leader of the band always tooted along on his sax. I was blessed to be a late part (although a very small part) of their orchestra. I’d love to have seen them in their heyday, and experienced the excitement of one of their dustbowl-era barn dances. Three years ago I discovered that my daughter-in-law had great-grandparents buried in a beautiful rural cemetery just outside of a tiny village about 6 blocks wide and about the same distance long. I knew these folks had a long history in the village and throughout the township. With my camera in tow, I picked a lovely early-summer day to drive the 15 miles to the cemetery, hoping to locate the graves, pay my respects, and take some nice photographs for her family history. The cemetery was well-kept and full of shady evergreen trees, and the sounds of various birds accented the hum of a tractor in the background. The weather was perfect. It felt good. I decided to photograph the entire cemetery, thinking that perhaps someone’s research might benefit from my efforts. I can tell you now, the person who benefitted the most was me. I found the great-grandparents about a third of the way through the cemetery. I had done so much research on them, I nearly forgot this was not my family as I stood at the foot of their graves and felt a bit emotional at the thought of actually being there. When I finished, I continued on my mission. I had not gotten too far when I discovered the great-grandmother’s mother, Effie Mae, buried in the cemetery as well, with her husband, Will. I kept going. I found Will’s parents, and his grandparents there. I found Effie Mae’s parents, and her grandparents buried there as well. Eight generations back, our little newborn grandson’s ancestors rested, dotted throughout the small cemetery. Today my son purchased the plot next to the great-grandparents, the original focus of my search, and we will lay our sweet little angel to rest there in a few days. I feel comforted that he is surround by history – HIS history – and that he will not be alone. For the last 100 years, members of his family have gathered in that cemetery, burying grandparents, parents, children, nieces, nephews and cousins. Now we will be among those to do so. I’ll think of his great-great-great-great grandmother, Jennie, as she buried her own 5 month old baby there. This still does not feel good, but it does feel right. My father had a huge trunk full of loose photos that had belonged to my grandmother, Lisa, who immigrated to the US from Norway in her 50’s, to marry my grandfather. Very few of these photos were labeled, and I had sat up late for several consecutive nights going through them, and scanning the many extremely small photos that must have been quite popular back then. I had to scan and enlarge them just to get a good look at the faces and places, all of which still went unrecognized. About halfway through what was seeming like a very un-fruitful job, I picked up this tiny little photo, scanned it, and to my amazement, recognized the names on the stones as being my grandfather’s parents in Norway. I knew little about them besides their names at that point. Seeing this very tangible proof of their existence brought them to life immediately for me. I would love to have yet another speechless moment, paying my respects in person, if someday possible. I don't know how I was lucky enough to have ended up with Grandpa Tom's rocking chair - perhaps it was just a matter of having a baby at the right time. I didn't even realize exactly what I was getting when they loaded this heavy, built-to-last chair into the back of the van and drove it 300 miles to my house. All I knew is that my cheap, "some assembly required" rocking chair had broken, and I had a young child who missed it desperately. I had seen the chair at my grandmother's house for as long as I could remember, in fact, I remember her re-upholstering the seat in the late 1960's. I never thought a thing about its origins, until I was browsing through some old pictures of my great-grandparents' home, and there it was! I assumed that after my great-grandmother, Virta, passed away, my grandparents inherited it. I asked my great aunt, Mabel, who was Virta's daughter, if she knew anything of it's origins, and she confirmed that it was Virta's father, Thomas L. Graves, who made this chair. Tom made two rocking chairs, my mother said, and what became of the other one, we do not know. Actually, Tom was a carpenter and a farmer by trade, among other ventures, and he not only constructed these two chairs, but numerous pieces of furniture, and with his son Delbert built a number of homes, barns, and even a two-story double-wide store in Esmond, South Dakota. In his spare time, he liked to whittle, using soft stone. Truly a creative man. I don't know when he built this rocking chair - he died in 1933, at the age of 71, and I'm not sure when he retired from his life of woodworking, or if death was what ended his avocation. But what I do know is that many generations of his young descendants were comforted in that chair, and his daughters, granddaughters, great-granddaughters, and great-great-granddaughters have tenderly held their sleeping infants in it. Most recently, my own granddaughter, Alyssa, who represents Generation Number Seven, joins the fold, and hopefully the tradition won't end there. Many thanks to Evelyn Yvonne Theriault for the Ancestor Approved award! It really made my day, Evelyn! 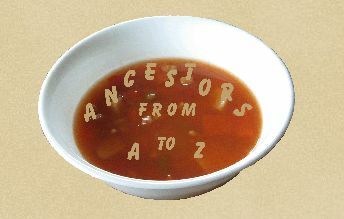 It's my job, now, to "list ten things I've learned about any of my ancestors that has surprised, humbled, or enlightened me, and to pass the award along to ten other bloggers whom I feel are doing their ancestors proud." 1. 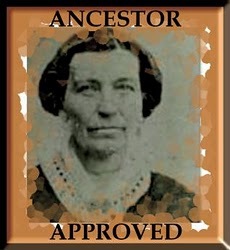 I was definitely humbled at the story of Rebecca Lair, my ancestral grandmother. That lady is an inspiration on how to survive bad circumstances. 2. I was surprised to learn of my grandmother's experiences in Norway during World War II. And very humbled. Would I have the guts to have lived her life as well as she did?? 3. I was surprised to discover my grandfather's long lost brother, in Iceland, and a whole new group of wonderful cousins. It truly is a small world, and it gave me hope of breaking down some other brick walls. 4. I was surprised to learn how many of my husband's ancestors were early pioneers in various areas, founding towns and living in some very primitive conditions. 5. I was enlightened to learn how difficult life could be for a new Irish immigrant in this country in the 1850s, and the ethnic prejudice that they had to endure. 6. I was delighted to learn more of my great-grandfather, Justin Meyer Jørgensen; not only facts about him, but stories and bits of information about him personally, and his part in family dynamics. I thought this information was unattainable, until I met my cousin, Tove, from Norway. Never stop hoping for the details you want so desperately. 7. Learning that my husband's grandparents stowed away on a train, to get where they needed to go, was a startling discovery! 8. Researching my husband's line, which includes numerous physicians, was definitely an education in early medical practices. Yikes! But also reading in old newspapers about how many times Dr. Seeman of Rockham, South Dakota, was summoned for various emergencies, makes me so proud of him. He was a dedicated country doctor. 9. I was surprised to learn that my husband's great-grandmother, Frances Stemper Joyce, delivered so many babies and tended to her sick neighbors, with her own large family to take care of. 10. I was delighted to learn my earliest ancestor "on this side of the pond" was here in 1623. It's staggering to comprehend that much elapsed time. Thanks again to Evelyn for the award, and thanks to all the bloggers who produce such interesting reading on our favorite topic.